At over 750 feet above sea level, it is the height of the land at Shaftesbury that has been the determining factor in its history. It was the Saxons who first founded a hilltop town here because of its strategic position overlooking the surrounding countryside. 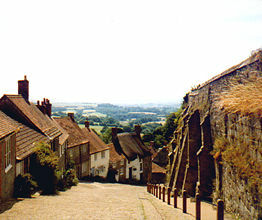 For the same reason King Alfred, of burnt cakes fame, made Shaftesbury a defended town in the 9th Century, after his defeat of the Vikings. He was so confident in its geographical security that he founded an Abbey for his daughter here......and so the history of this beautiful Dorset village begins, and so, we begin our exploration of Shaftsbury. There's a gallery to view the village, the town council are very likely in session, a community awareness programme, The Swans Trust, lots of information for the tourists, the online learning site, Shaftsbury On Line....and...you can download views of Shaftsbury for the desktop of your computer.....Enjoy! the lifestyle of local society.